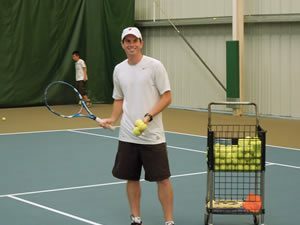 Timberhill Tennis Club offers instruction for any level of player. From a beginning adult player to tournament juniors or competitive adult USTA leaguers, we’ve got you covered in either a group or private setting. Check out our schedule of group classes for kids or for adults, or arrange a time with one of our outstanding teaching pros for a one-on-one private lesson. See you on the court! Men's doubles league run by the Timberhill Tennis Club staff. Each week you’ll play three sets of doubles—partnering with a different player on your court for each one—and record your score. Each set is a “race to 6″—no tiebreaker, so the final score can be 6-5. Each court may choose whether they want to play ad or no-ad. The highest two scores on your court that week move up a court for the following week, and the lowest two scores move down. The player who wins the most total games by the end of the league is the big winner. Balls are provided by the club. Great way to meet new player to hit with. $10 per player (to be redistributed as prize money). Sign up individually. Timberhill Tennis Club Pros will create teams with random draws from each skill division. Round robin format guarantees the same number of matches for everyone. Timberhill Tennis Club Pros will organize, referee, keep track of scores, and keep you moving. Women's doubles league run by the Timberhill Tennis Club staff. Each week you’ll play three sets of doubles—partnering with a different player on your court for each one—and record your score. Each set is a “race to 6″—no tiebreaker, so the final score can be 6-5. Each court may choose whether they want to play ad or no-ad. The highest two scores on your court that week move up a court for the following week, and the lowest two scores move down. The player who wins the most total games by the end of the league is the big winner. Balls are provided by the club. Great way to meet new player to hit with.